The brightest pulsar ever recorded has been discovered in the M82 galaxy. This object is an "ultraluminous X-ray source" (ULX), a class of objects that astronomers previously thought contained a stellar-mass black hole or neutron star. NuSTAR, a high-energy X-ray telescope, detected unusual pulsations in the ULX. Astronomers used Chandra to identify exactly which X-ray source was emitting the pulsations and other unusual behavior. Astronomers used NASA's NuSTAR (Nuclear Spectroscopic Telescope Array) and Chandra X-ray Observatory to study two ULXs in the center of M82, a galaxy located just over 11 million light years from Earth. This composite image shows X-rays from NuSTAR (purple) and Chandra (blue) that have been combined with optical data from the NOAO 2.1 meter telescope (gold). The extended X-ray emission is unrelated to the two ULXs. Until now, astronomers have thought that matter falling onto black holes powered the bright X-ray emission in all ULXs. Most of the black holes in ULXs are thought to weigh at least 10 to 50 times the mass of the Sun, but some of the brightest ULXs are thought to weigh 100 times the Sun's mass, or more. 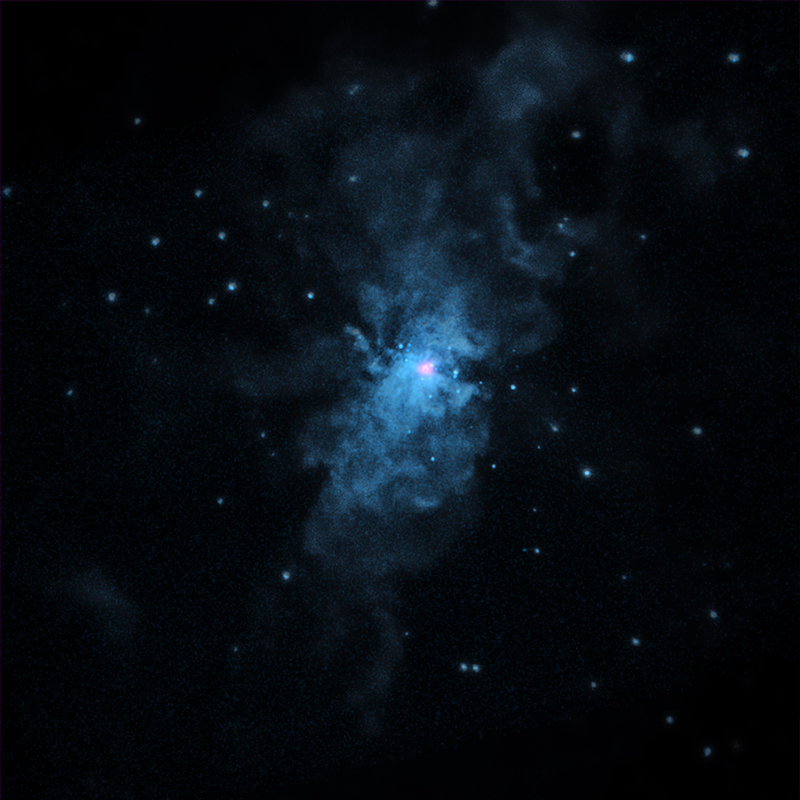 The new X-ray data provide a critical clue to the nature of one of the ULXs in M82. Using NuSTAR, scientists have discovered regular variations, or "pulsations," in the object known as M82X-2. This object pulses once on average every 1.37 seconds, and pulsations change in a regular pattern with a period of 2.5 days. These types of pulsations are not seen with black holes. Rather, they are the signatures of so-called pulsars, rapidly rotating neutron stars. The apparent shifts in the pulsation period are due to the motion of the star in its orbit. Assuming that the pulsar weighs 1.4 times the mass of the Sun (the common size of a pulsar or neutron star), the data imply that the companion star's mass is at least 5.2 times the mass of the Sun. This discovery is significant because it may mean that pulsars make up a significant part of the ULX population. 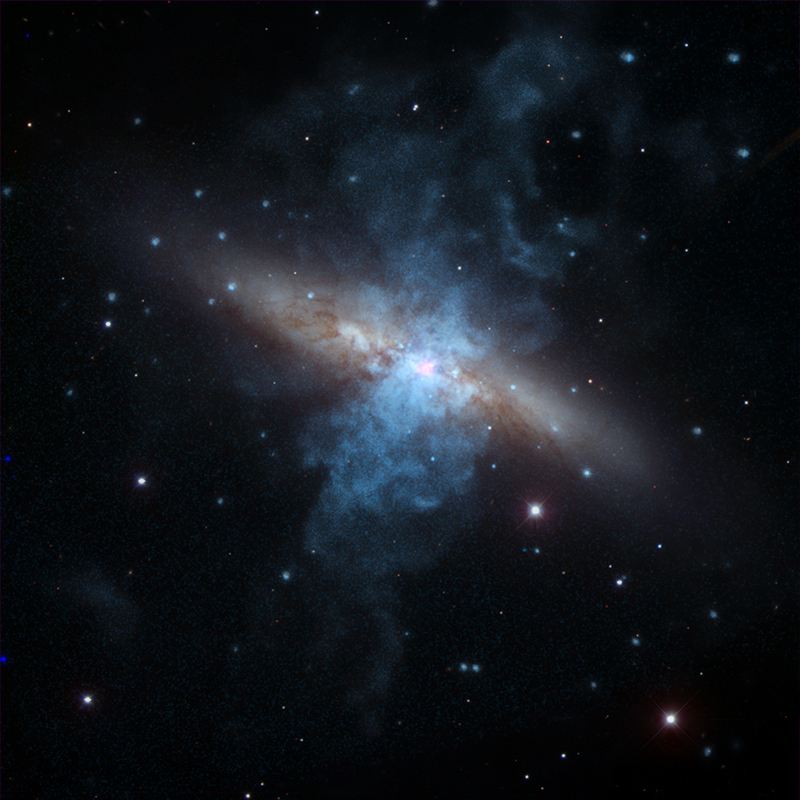 Chandra had observed M82X-2 before but these pulsations were not found until observations were made by NuSTAR, a high-energy X-ray mission that was launched in 2012. While NuSTAR detected the pulsations, Chandra, with its excellent spatial resolution, was needed to resolve M82X-2 from the other nearby ULX and rule out the contributions from other possible sources unresolved by NuSTAR. Although Chandra did not detect pulsations from M82X-2, scientists determined which source was responsible for the pulsations seen by NuSTAR by comparing the Chandra and NuSTAR images. In addition to the pulsations, the overall brightness in X-rays of M82X-2 is variable over timescales lasting weeks and months. At its brightest it is more than ten times brighter than any known pulsar that is powered by accretion of material from a companion star. It is so bright that generally astronomers thought that only 50 to 100 solar mass black holes could explain such a bright ULX. The latest study of M82X-2 provides new challenges for theorists to develop models explaining how a pulsar can pull matter inward and produce such copious X-rays. When matter is pulled toward a dense, compact object, like a pulsar, neutron star, or black hole, it is heated and produces X-rays. These X-rays create a radiation pressure that pushes out on the matter. For sustained infall of matter, the radiation pressure of the X-rays should be less than the pull of the compact object's gravity. The X-ray luminosity of M82X-2 reaches about 100 times brighter than the threshold where the outward pressure from radiation balances the inward pull of gravity of the pulsar, the so-called Eddington limit. Possible explanations for violations of the Eddington limit include geometrical effects arising from the funneling of infalling material along magnetic field lines. The authors of the study that appears in the journal Nature are Matteo Bachetti (University of Toulouse, France), Fiona Harrison (California Institute of Technology), Dominic Walton (Cal Tech), Brian Grefenstrette (Cal Tech), Deepto Chakrabarty (Massachusetts Institute of Technology), Felix Fuerst (Cal Tech), Didier Barret (Toulouse), Andrei Beloborodov (Columbia University), Steven Boggs (University of California, Berkeley), Finn Erland Christensen (Technical University of Denmark), William Craig (Lawrence Livermore National Laboratory), Andy Fabian (University of Cambridge), Charles Hailey (Columbia University), Ann Hornschemeier (Goddard Space Flight Center), Shri Kulkarni (MIT), Tom Maccarone (Texas Tech University), Jon M. Miller (University of Michigan), Vikram Rana (Cal Tech), Daniel Stern (Jet Propulsion Laboratory), Shriharsh Tendulkar (Cal Tech), John Tomsick (University of California, Berkeley), Natalie Webb (Toulouse), and William Zhang (GSFC). Observation Time 228 hours 26 min (9 days, 12 hours, 26 min). How you can estimate the map of local super cluster while you can not see this cluster or any original picture? and how you can imagine the map of Local super cluster? Howdy... Hello... Once again Chandra shows the excellence of essence. Great Teamwork. This is a highly impressive change in discovery and opens up so much more research to be done. I recently read that the estimated number of galaxies in our observable universe had increased to around 1 trillion. Does this discovery alter that estimate? An Ultraluminous X-ray Source (ULX) 12 million light years from Earth. 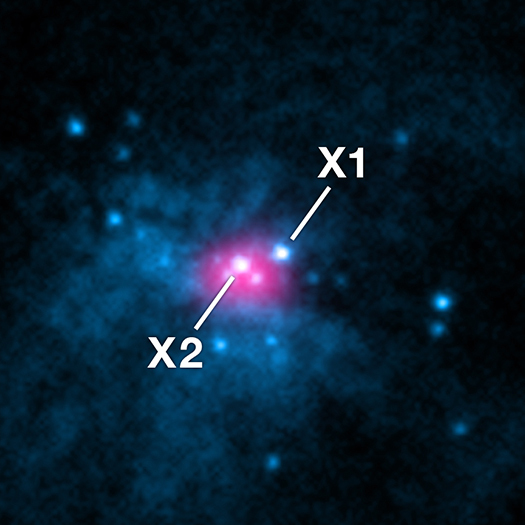 X-rays from the Chandra X-ray Observatory and NuSTAR and optical from the NOAO 2.1 meter telescope. In the constellation Ursa Major in the Northern Hemisphere.